Level of Isolation: e.g. the possibility or not to fully isolate the process and/or the equipment. Not always the equipment needed in the process are ready to be fully isolated, or for some reasons a fully isolated system will complicate drastically the process. 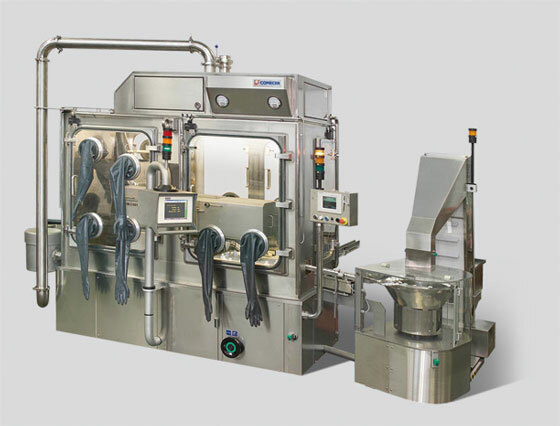 In the picture below there is an example of a tablet counting and a bottle filler machine (always for tablets) inside a “containment cabinet” (barrier). The cabinet cannot be considered a real Isolator (that must be fully closed), in any case the operator protection is ensured by the air flow. During the machine validation, using a tracer (smoke) and anemometers, it is possible to demonstrate that air can enter from the 4 foreseen openings only. NO air and than NO contamination is escaping. This is an example of Open Isolator: the process and transfer are highly isolated. The typical application is for production process which foresee small openings for exiting of bottles or vials.